MAHAN BRAHMA SHRI GOPALVALLIDASAN IS A BLESSING FOR ALL OF US IN THIS KALIYUGA. RIGHT FROM THE TIME HE WAS IN THE WOMB HE WAS OPPOSED. HOWEVER THE INTENTIONS OF LORD KRISHNA WERE SOMETHING ELSE .NO ORDINARY PERSON HAS THE RIGHT TO CHANGE OR CHALLENGE IT. SO TODAY WE ARE BLESSED WITH HIS PRESENCE. INITIALLY HE WAS LEADING A NORMAL LIFE LIKE ANY OTHER ORDINARY PERSON. HIS LIFE WAS MISERABLE AND FRIGHTENING FOR HIM. HE HAD MADE MANY EFFORTS AND TRIED EVERY OTHER ALTERNATIVE TO LEAD A HAPPY LIFE.BUT EVERYTHING WAS IN VAIN.EVEN EDUCATION AND A GOOD JOB COULD'NT GIVE HIM HAPPINESS. HE HAS DONE DIPLOMA IN MECHANICAL ENGINEERING. BUT HE WAS SEARCHING FOR SOMETHING ELSE. 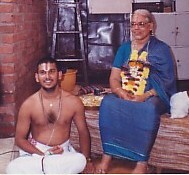 ONE DAY HE HAD GONE TO GURUJI AMMA'S HOUSE TO LEARN YOGA FROM GURUJI AMMA'S HUSBAND WHO IS ALSO A DOCTOR BY PROFESSION. THIS PROVED TO BE A TURNING POINT IN HIS LIFE. HIS SEARCH ENDED HERE. KALAU NASTYAIVA NASTYAIVA NASTYAIVA GHATHIR ANYATHA. NAMAJAPAM (I.E. CHANTING THE LORD'S NAME) WHICH WAS SUGGESTED TO HIM BY GURUJI AMMA AND A GREAT RESPECT FOR GURUJI AMMA.THIS PROCESS CONTINUED AND SLOWLY HE STARTED REALISING THE POWER OF GURUJI AMMA AND NAMAJAPAM. A SATHGURU KNOWS WHO AND WHERE THEIR SHISHYAN IS. 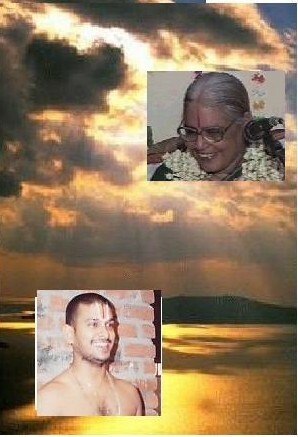 GURUJI AMMA WAS MAKING HIM REALISE WHO HE IS AND THE PURPOSE FOR WHICH HE HAS COME. ONE DAY HE WAS ON HIS WAY TO A SHOP , CHANTING WITHIN HIMSELF. SOON HE COULD FEEL THAT SOMEONE WAS CALLING HIM. SO HE LOOKED ALL AROUND BUT WAS UNABLE TO FIND ANYONE. CONSIDERING IT AS AN ILLUSION HE STARTED PROCEEDING. BUT ONCE AGAIN HE COULD HEAR THE SAME VOICE. HE TRIED TO FIND OUT WHAT EXACTLY IT WAS. THIS CONTINUED AND LATER ON HE REALISED THAT IT WAS NEITHER HIS ILLUSION NOR WAS ANYONE CALLING HIM FROM OUTSIDE. THE VOICE HE WAS HEARING WAS FROM WITHIN. THE VOICE ASKED HIM TO SPEAK. ALL THIS WAS HAPPENING WHEN HE WAS ON HIS WAY TO THE SHOP. HE QUESTIONED THE VOICE. THE VOICE REPLIED " I AM LORD KRISHNA"!!!! HE WAS NOT READY TO BELIEVE IT. 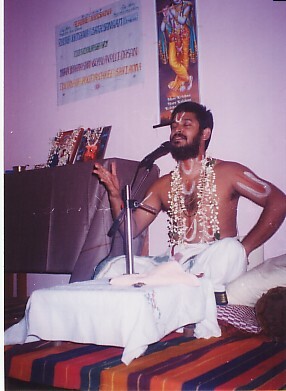 HE TOLD " IF YOU ARE REALLY THE LORD , RECITE THE GITA." LORD KRISHNA REALLY RECITED THE GITA. IT MAY BE HARD TO BELIEVE THIS. BUT IF ONE HAS UNCONDITIONAL FAITH IN LORD KRISHNA AND CHANTS CONTINUOUSLY ONE CAN TOO DERIVE THE SAME HAPPINESS. TILL THAT DAY HE DID'NT KNOW ANYTHING ABOUT THE GITA EXCEPT THAT IT WAS TOLD BY LORD KRISHNA TO ARJUNA. THEN HE REALISED THAT IT WAS NOT HIS OWN INNER CONSCIENCE BUT IT WAS INDEED THE LORD SPEAKING TO HIM!!!! AT THAT MOMENT ALL HIS SUFFERINGS PERISHED . THE HAPPINESS HE DERIVED WAS UNPARALLELED AND THIS WAS THE BEGINNING OF A NEW PHASE OF HIS LIFE. HE WAS STILL IN THE SAME HANGOVER AND HAD NOT YET COME OUT OF IT. AFTER HAVING SUCH A WONDERFUL EXPERIENCE HE RETURNED TO GURUJI AMMA'S HOUSE. AT THAT TIME GURUJI AMMA WAS DOING SATSANG. WHEN GURUJI AMMA SAW HIM SHE TOLD THAT FURTHER SATSANG WILL BE CONTINUED BY HIM. THIS WAS A SECOND SURPRISE FOR HIM AS HE HAD COME TO TELL THIS INCIDENT TO AMMA BUT INSTEAD WAS INSTRUCTED TO CONTINUE THE SATSANGAM. AS INSTRUCTED HE DID THE SATSANGAM BUT THE FACT REMAINS THAT EVEN TODAY HE DOESN'T REMEMBER WHAT HE HAD TOLD IN THAT FIRT SATSANGAM OF HIS LIFE. "I JUST SAT AND EVERY WORD I HAD UTTERED CAME OUT BY ITSELF UNKNOWN TO ME", HE TOLD ON A LATER DATE. THIS INCIDENT IS TESTIMONY THAT HE'S LORD KRISHNA'S CHOSEN ONE . AFTER THE SATSANGAM AND AFTER ALL THAT DAY'S INCIDENTS HE FELT VERY THIRSTY. AS HE PROCEEDED TO THE KITCHEN AND TOUCHED A GLASS HE IMMEDIATELY STARTED TO FEEL THE PRESENCE OF GURUJI AMMA. THIS HAPPENED WITH EVERY VESSEL HE TOUCHED. THIS WAS BECAUSE IN VAISHNAVA TRADITION ONE SHOULD NOT USE THE ACHARYAN'S BELONGINGS. HIS THIRST REACHED SUCH AN EXTENT THAT HE BECAME RESTLESS. ATLAST HE SAT AND WENT BACK TO THE SAME DHYANAM. HIS MIND BECAME ONE WITH LORD KRISHNA. HIS VERY SURROUNDINGS STARTED CHANGING. ANOTHER SISHYAI WHO WAS MOVING AROUND WITH SOME WORK FOUND SOMETHING ODD ABOUT HIM AND IMMEDIATELY CALLED GURUJI AMMA. GURUJI AMMA HAD TO BRING HIM OUT OF HIS DHYANAM OR ELSE HE WOULD HAVE BECOME ONE WITH LORD KRISHNA, SUCH WAS HIS DHYANAM. AS HE CAME BACK TO A NORMAL STATE HE ASKED GURUJI AMMA AS TO WHY SHE HAD DISRUPTED HIS DHYANAM. TO THIS GURUJI AMMA REPLIED,"THE HAPPINESS WHICH YOU HAVE DERIVED IS TO BE PASSED ON TO EVERYONE AND NOT END WITH YOU. FROM NOW ONWARDS YOUR LIFE IS FOR THE BETTERMENT OF THIS MANKIND BY SPREADING KRISHNA BHAKTHI." HIS EXPERIENCES INCREASED DAY AFTER DAY. THE EXPERIENCES HOWEVER ARE SUCH THAT THEY CANNOT BE DISCLOSED. ALONGWITH THE EXPERIENCES HE PROGRESSED ON TO BECOME A MAHATHMA. THIS INCIDENT ALSO MADE HIM DETACH HIMSELF FROM OTHER WORLDLY BONDAGES. ILLAI ENAKKU EDHIR ILLAI ENAKKU EDHIR ILLAI ENAKKU EDHIRE!! DESCRIBED ABOUT THE INDICATIONS OF A SATHSISHYAN. TO UNDERSTAND THESE QUALITIES THE BEST EXAMPLE WOULD BE OUR GURUJI. IF YOU FEEL THIS AS AN EXAGGERATED STATEMENT THEN YOU SHOULD SEE HIM IN THE PRESENCE OF HIS GURU. 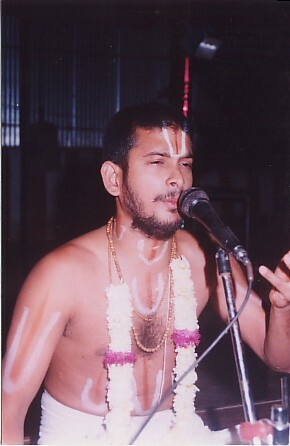 A SATHSISHYAN BEFITTING A SATHGURU. HIS SOLE AIM AS A SATHSISHYAN IS THAT THE WORLD SHOULD REALISE THE PRESENCE OF GURUJI AMMA IN THIER MIDST.HIS WORLD IS RESTRICTED TO GURUJI AMMA. TRUE TO A SATHSISHYAN HE KNOWS THE LIKES AND DISLIKES OF HIS GURU AND FULFILLS THEM EVEN BEFORE SHE CAN EXPRESS IT TO HIM. 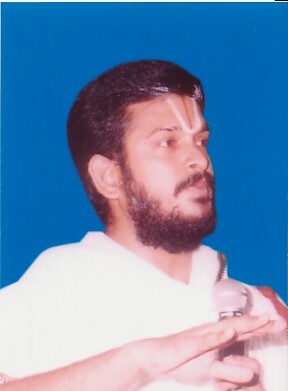 IF GURUJI AMMA IS RAMANUJAR THEN OUR GURUJI IS UNDOUBTEDLY NONE BUT VADUGANAMBI. SATHGURU IS NOT SOMEONE WHO IS JUST ANOTHER HUMAN BEING WITH SOME MORE AMOUNT OF BHAKTHI THAN US. HE IS THE SUPREME CREATOR OF THE UNIVERSE IN DISGUISE TO TEACH US TO REACH HIM THROUGH BHAKTHI. OUR GURUJI IS NO EXCEPTION. WHEN WE IMAGINE OURSELVES IN A LIFE DEVOID OF HIM. DARKNESS IS WHAT WE SEE. AS A SATHGURU HE HAS INSTILLED MEANING IN OUR LIVES. THE CONFIDENCE, THE DETERMINATION AND THE COMFORT HE HAS GIVEN US IS SOMETHING NO OTHER PERSON COULD HAVE. NOT EVEN OUR OWN PARENTS,THE DEAREST OF OUR FRIENDS, RELATIVES, TEACHERS. NONE. SATHGURU IS SOMEONE WAY ABOVE THE REST. UNMATCHED. UNPARALLELED. WE CAN SAY THIS CONFIDENTLY BECAUSE WE KNOW WHAT WE WERE AND NOW WHAT WE ARE DUE TO HIS GRACE. THERE ARE SOME THINGS WHICH MAKE HIM MORE POWERFUL THAN GOD HIMSELF. WE CAN APPROACH HIM AT ANY TIME. HE DOESN'T RESTRICT HIMSELF TO SATSANGS AND PRAVACHANS BUT GUIDES US IN OUR EVERY STEP AND TAKES PERSONAL INTEREST IN THE LIFE OF EACH OF HIS DISCIPLES. SUCH EFFORTS OF HIS CAN EVEN MAKE A JEWEL OUT OF A STONE. ALL HE EXPECTS FROM US IS TO BE HAPPY IN OUR LIVES BY DOING CONSTANT NAMAJAPAM. HIS PRAVACHANS HAVE INCULCATED IN US TRUE RESPECT FOR OUR COUNTRY AND HINDU DHARMAM. HE SHOWED US THE TRUE FORM OF BHAKTHI i.e. NAMAJAPAM AND THE EASIEST WAY TO REACH GOD. ALL WE CAN SAY IS YOU TOO SHOULD DERIVE THE SAME HAPPINESS WHICH WE HAVE GOT. SURELY WE ARE THE MOST FORTUNATE ONES TO BE LOST IN THIS WORLDLY OCEAN ONLY TO BE SAVED BY THIS LION AMONG MEN.